We take spam and data abuse very seriously! With the use of mailflatrate, every user is contractually obliged to comply with the permission marketing guidelines. In this way we want to prevent abuse in the form of spam. This is the only way to ensure that mailings are sent effectively. Our security measures and anti-spam guidelines also ensure that there is no abuse or interference. However, if there is a situation where you have to complain about this, please contact our abuse team abuse@mailflatrate.com. 1. mailflatrate.com checks and activates each account individually. At the same time we also ask for the exact origin of the e-mail lists. 2. E-mail addresses such as info@…, support@…, sales@… are generally not accepted by us for mailings. In most cases such e-mail addresses are addresses of companies with changing owners or the contact person is not even known. Therefore, we do not allow the use of these e-mail addresses, as there is usually no fixed person behind the address and we have to assume that these addresses were collected in a way that does not comply with our anti-spam guidelines. 3. Only after approval of our terms and conditions and anti-spam guidelines can our service be used. We therefore point out this to our users several times when using our software. In order for the mailings to be sent, the user must agree to the guidelines by ticking the box and confirming them explicitly. 4. In order to be able to collect new e-mail addresses in accordance with the guidelines, we offer our customers the opportunity to use an appropriate registration form. These forms can then be integrated on the own website and work exclusively with the Double-Opt-In procedure, which we have listed in our anti-spam guidelines. This provides accurate proof of each subscription through information about the opt-in (source, IP & timestamp). 5. Each email campaign must include a link that allows the recipient to unsubscribe for future mailings. Furthermore, each mailing must contain a complete imprint so that the sender of the mailings can be identified. A masking by sender address is prohibited. 6. Recipient lists are automatically cleansed of soft and hard bounces. 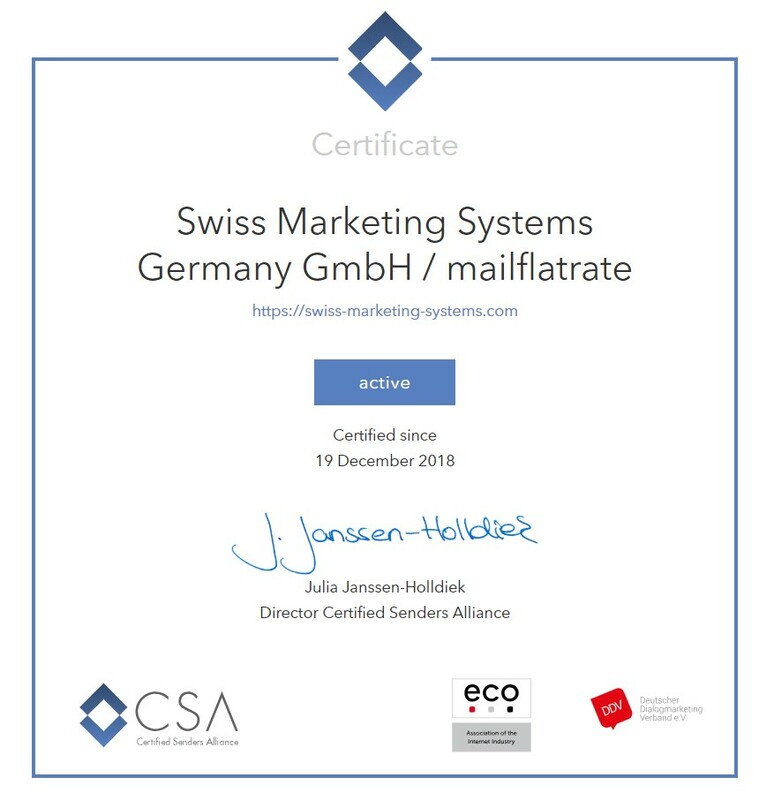 7. mailflatrate.com is a member of the Certified Senders Alliance and is therefore subject to the very strict requirements that all users of mailflatrate.com must adhere to. Every e-mail campaign receives a unique mailing ID from us. This can be found in the header of the e-mail. Such an ID helps us to identify the sender of the e-mail more quickly and to obtain information about the background of an unwanted mailing. In case of complaints it is mandatory to include the Mailing ID. Alternatively you can send us the complete e-mail as an attachment to abuse@mailflatrate.com send.